ULAplus™ 10th Anniversary Collection by Source Solutions, Inc. Classics from over 30 publishers including Bug Byte, Gargoyle, Gremlin, Imagine, Melbourne House, Ocean, Psion and Vortex. 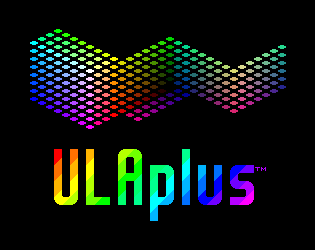 Games written specifically for ULAplus™ from John Blythe, Jonathan Cauldwell, Andy Johns and the Mojon Twins. 20 demos including slideshows and technical demos. All titles provided in .tap format for use with emulators and real hardware. 50 palette files to use with games not included in the collection. Source code for the HAM256 and HAM8x1 software video modes. 256 color palette files in .aco and .pal format.